Documentary, 1871, Second Issue, 50¢ blue & black, sewing machine perfs, neat manuscript cancel, horizontal crease, F.-V.F. appearance. Documentary, 1871, Second Issue, $10 blue & black, bright colors, wide margins, neat manuscript cancel, Extremely Fine; ex-Inman, with 2016 P.F. certificate. 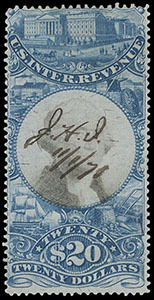 Documentary, 1871, Second Issue, $20 blue & black, nicely centered with rich color, neat manuscript "J. H. J., 11/1/71" cancel, small thin spot, F.-V.F. appearance. 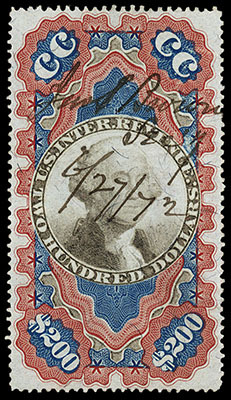 Documentary, 1871, Second Issue, $200 red, blue & black, bright colors, impressive centering with wide and balanced margins, neat "Jun. 27, 1872" manuscript cancel, Extremely Fine; with 2012 P.S.E. certificate (XF 90; Revenues are unpriced in SMQ). A STUNNING EXAMPLE OF THE $200.00 "SMALL PERSIAN RUG" GRADED XF 90 BY P.S.E -- ONE OF THE MOST COLORFUL STAMPS IN UNITED STATES PHILATELY. ONLY 446 OF THE SMALL "PERSIAN RUG" WERE ISSUED. 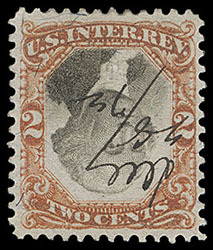 Documentary, 1871, Third Issue, 2¢ orange & black, center inverted, neat manuscript cancel, well centered, strong colors, Very Fine and choice; with 1988 P.F. certificate. 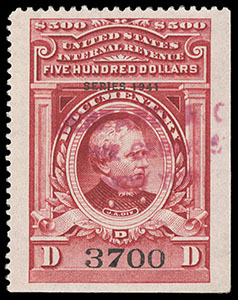 Documentary, 1941, $500 carmine, red three-line handstamp cancel, beautifully centered amid wide margins, rich radiant color, an Extremely Fine gem. 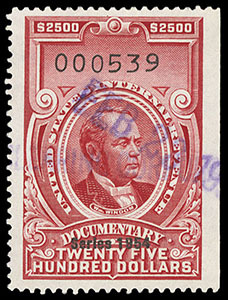 Documentary, 1954, $2,500 carmine, purple straight line date stamp cancel, exceptional centering amid wide margins, rich color, an Extremely Fine gem. 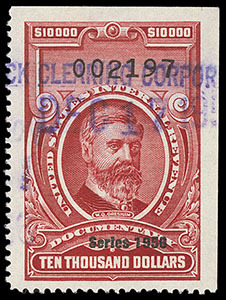 Documentary, 1956, $10,000 carmine, purple straight line date stamp cancel, rich deep color, uncommonly wide margins and choice centering, Extremely Fine, one of finest extant; with 2002 P.S.E. certificate.